Today I am collecting signatures on a thank you card for our local police, to say thank you for their support during the riots. I am hoping that the little gestures can be important sometimes! I'm wearing a blue shirt (with horse shoes on), and black vest (from Wallmart years ago!) and my new jeans from Oasis. 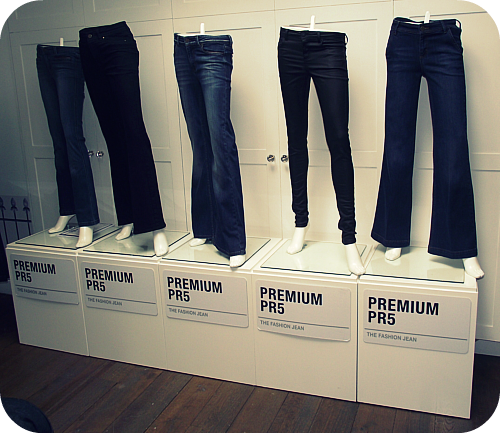 A short while ago, I was lucky enough to be invited to the launch of Oasis' new premium range of denims. I was able to try them all on, and literally I knew I had to have these the moment I slipped them on. They are almost leather-like, I guess they are a plasticised denim, almost like rubber. They have stretch and feel fabulous on. I had to wait a little while for them to be ready, but yesterday an exciting Oasis biker dropped them off. They are officially my 'rock chick' pants now (the word pants feels more appropriate here rather than trousers/jeans).